Flickr might fall under the ever-dimming Yahoo banner, but the photo-sharing service is doing it’s very best to remain relevant. Today Flickr announced that it will be working with Aviary to provide editing solutions to its users in the wake of Picnik’s shutdown. The benefits are two-fold: no longer does a Yahoo property have to use a competitor’s (Google’s, no less) product, and it will translate to various devices better. The rollout of the new feature starts tomorrow and will continue over the next couple weeks. Aviary is also written in HTML 5, so it’ll be iOS compatible. The Aviary client makes a lot of sense as a new choice for Flickr, and it’s undergone its own mobile redesign. It’s software has, across the board, really refined its user interface and experience since launch, and the company is really making its case as a top choice for applications looking to integrate with a third party photo editing solution. While Flickr continues to stand its veteran photo-platform ground, it’s definitely feeling some heat from the new kids in town. The likes of Instagram, Hipstamatic, and PicPlz have decidedly dominated the mobile-photo market, and Flickr has had to sort of make due and adapt. It’s a whole other animal: it built itself for hobbyist and professional photographers who wanted a clean, Web-based way to share photos – but photography has been disrupted by the smartphone. While Flickr’s mobile app is fairly popular, the site is a holdover from a different utility altogether, so it’s difficult to try and fill both niches. But the addition of Aviary means that Flickr isn’t another dead in the water Yahoo product and that it’s going to keep evolving and growing. And the addition gives it something that Facebook, the most popular photo-sharing platform, still (unbelievably) doesn’t have. 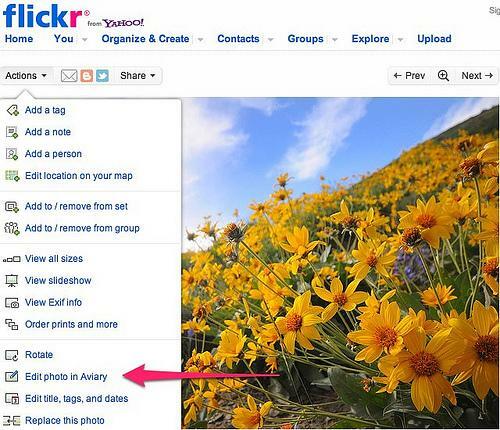 Even if Yahoo starts selling off its limbs, Flickr’s is going to stay in one piece.